Rosenbaum used a collection of recycled plastic bottles to transform a corridor outside a colorful home in Sao Paulo into a sprawling vertical garden. The garden was made by stringing the bottles horizontally in a grid along an interior wall and then filling them with soil and herbs for the family to use in day-to-day cooking. The project was designed in collaboration with television producer Luciano Huck for a program called Home Sweet Home. For Home Sweet Home, Rosenbaum transformed over fifty Brazilian homes with colorful makeovers that were easy on the wallet. Their beautiful homemade vertical garden infuses a home’s walkway with greenery, and it can be constructed almost entirely with found materials. Cilantro, basil, parsley, chives and lettuce grow in tufts all along the walkway, infusing the air with fresh scents. To construct the garden Rosenbaum first collected hundreds of plastic soda and water bottles and then rinsed them and stripped them of their labels and logos. A rectangular cut was then made in each bottle to serve as the top of the planter. Rosenbaum then threaded the bottle planters together in columns by poking holes at either end of each bottle and holding them in place with anchor weights. Spaced evenly apart, the columns of bottle planters were hung along the wall to form a grid. Each bottle is then filled with dirt and seeds, and voila – a living vertical garden. The firm released an official instruction manual (in Portuguese) to inspire others to create their own vertical gardens that not only grow food, but also repurpose plastic bottles found around the house. 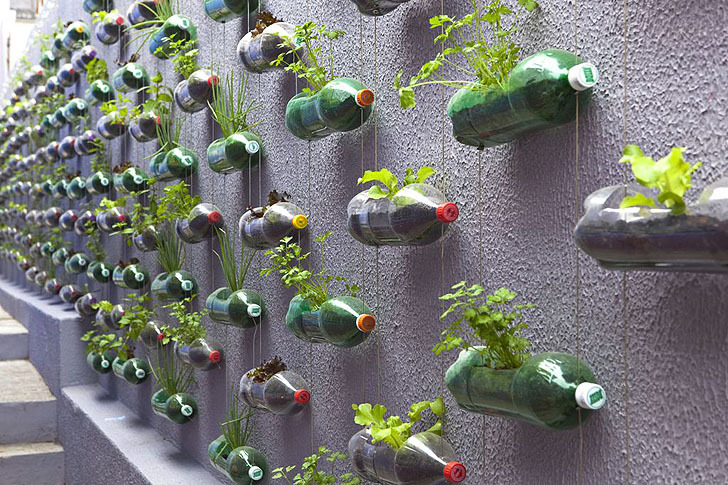 This is a pretty wall garden, but not a practical one as one has to water each bottle separately. That problem could be solved by hanging the bottles in vertical columns and having a couple of drainage holes at the bottom of every bottle. Thus, one could water the top bottle of every column and water would drip from bottle to bottle. Anyway, I prefer to set up bottle towers (see my You TUBE-videos on that method). For Home Sweet Home, Rosenbaum transformed over fifty Brazilian homes with colorful makeovers that were easy on the wallet. heir beautiful homemade vertical garden infuses a home's walkway with greenery, and it can be constructed almost entirely with found materials. Cilantro, basil, parsley, chives and lettuce grow in tufts all along the walkway, infusing the air with fresh scents. To construct the garden Rosenbaum first collected hundreds of plastic soda and water bottles and then rinsed them and stripped them of their labels and logos. A rectangular cut was then made in each bottle to serve as the top of the planter. Rosenbaum then threaded the bottle planters together in columns by poking holes at either end of each bottle and holding them in place with anchor weights. Spaced evenly apart, the columns of bottle planters were hung along the wall to form a grid. 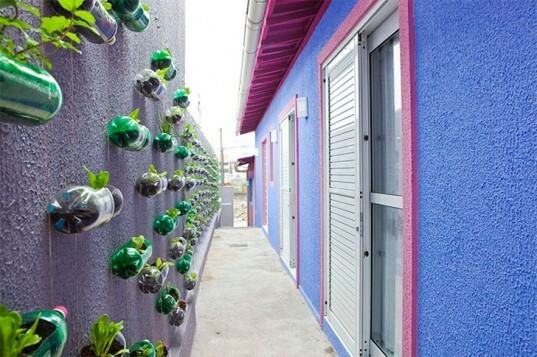 Each bottle is then filled with dirt and seeds, and voila - a living vertical garden.